There is nothing explicitly vegan on the menu at Tea Kiosk cafe, but when we spoke to the chef he was very happy to make something to suit and even checked through the ingredients with us. At the time we visited the following meals could be made vegan: vegetarian burger & chips, vegetable stir-fry, and vegetarian pizza. There is also fruit salad in the cabinet. The chef made a point to tell us that the bread and baguettes in the cabinet are NOT vegan but their hamburger buns and pizza dough is. You can view their full menu below (click to enlarge). Staff at Malabar were very knowledgeable regarding what on their menu is suitable for vegans. Some vegan options are labelled as such, but others are not - so it pays to ask! The takeaway menu has stir-fried vegetables; when dining in there are several options, such as: roasted cashew nut and baby corn salad with tamarind dressing, onion & spinach bhajis with tomato chilli dip, and wok fried tofu and asian green with crispy chilli garlic tortilla. The Moroccan vegetarian tagine with garlic pita & Spanish rice can also be made vegan on request. 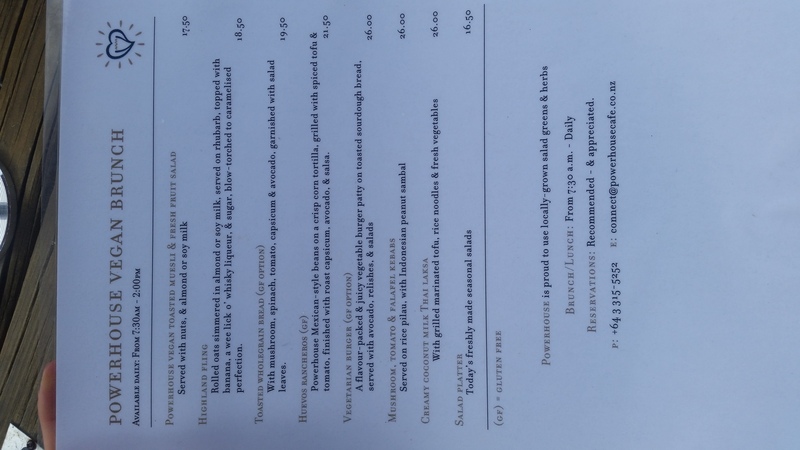 Powerhouse Cafe have an entirely separate vegan brunch menu with delicious sounding options! Click on the image below to view their full vegan menu. Isobel's Restaurant (located inside the Heritage Hotel) has labelled vegan options on their menu, including a vegan dessert. Robbie's has a separate vegetarian menu with items which can be made vegan. Click to view their vegetarian menu below. Coriander's have menu items which can be made vegan on request. Vegan and sugar free fudge available! See their range here. Si has at least 3 flavours of sorbet daily - all of which are vegan.